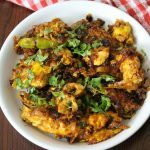 Egg masala fry is a simple and quick egg curry recipe to be served with chapati mainly and is a popular egg masala in hyderabadi style. This is one of the best and easiest form of egg recipe made with just onions and eggs and no other ingredients are required to make the egg curry. This side dish is not that suitable with rice but very much a good accompaniment with chapati and hope my viewers find this recipe as a perfect hyderabadi style of making egg curry. Basic spices and herbs are enough to make this wonderful egg masala. 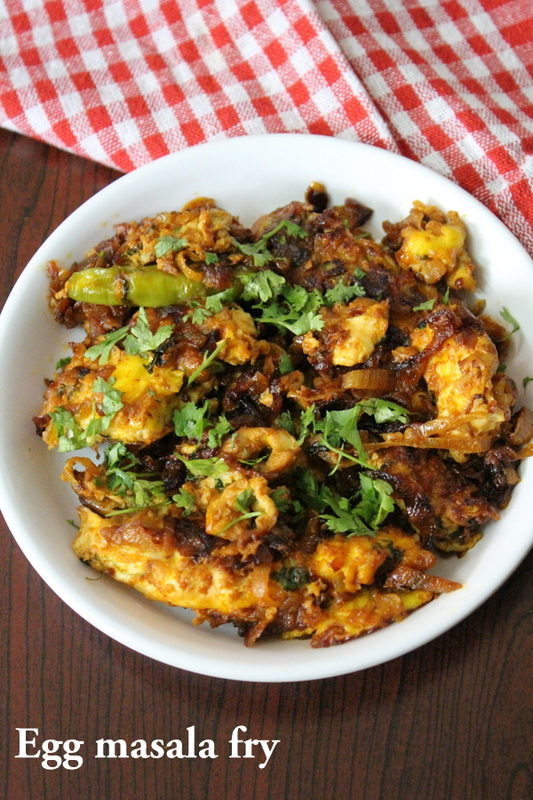 This version of egg recipe is a very common egg masala fry made with raw eggs and onions and is usually made as a breakfast recipe to be served with chapati. The recipe can be cooked in just a couple of minutes and almost tastes like fried form of eggs but in fried eggs we use boiled eggs and here we make use of raw eggs that are finely cooked in sauteed onions. This way of cooking onions and eggs gives a delicious taste to the curry and is a dry form of curry suitable to be eaten with roti, phulka or paratha. Eggs are basically used to make quick recipes and are commonly used to make breakfast recipes and I hope to make more egg recipes that are suitable for kids breakfasts or for their lunch box recipes. Eggs are the best way to make quick and easy recipes that are very instant and quite filling if they are used in making sandwiches or used to make stuffed egg paratha. 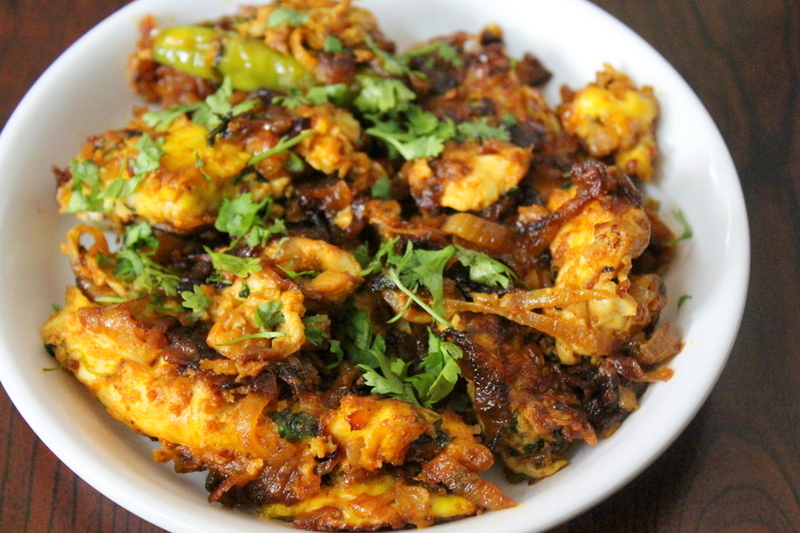 A simple and quick egg curry recipe made using eggs and onions. Firstly, take a pan, add oil and heat it. Add finely sliced onions, saute and cook them until they turn soft. Cook the onions until they turn slight golden in color. Add slit green chillies and cook until the onions are nice and golden. Add red chilli powder, turmeric powder, coriander leaves. Mix them well and cook the masala well for few minutes on low flame. Add some water and give a mix. Break the eggs and add them into the masala. Add some freshly chopped coriander leaves. Cook the eggs for few minutes on low flame. Flip the eggs and cook the other side too for few minutes on low flame. Make sure both the sides of the eggs are cooked well. Once done, switch off the flame. Serve the egg masala fry with roti or chapati. 1. Here I have fried the onions until they turned golden in color and little late can make the onions burn and spoil the curry. 2. Therefore, one has to be very careful in cooking the onions and not let them cook until they reach a stage where they can burn if little late in adding the spices. 3. After adding the spices do not cook on high flame as the spices may burn the masala. Cook it on low flame and just for few seconds. 4. Following these simple tips could make your egg masala an easy and a delicious egg dish. Egg masala looking so yummy. Nice recipe.